After laying our hands on an old Tandy 5000 advertisement from 1989, TMO staff member Brandon Drezner dug up two old Apple ads that he had. We offer them for you enjoyment, so take a look! 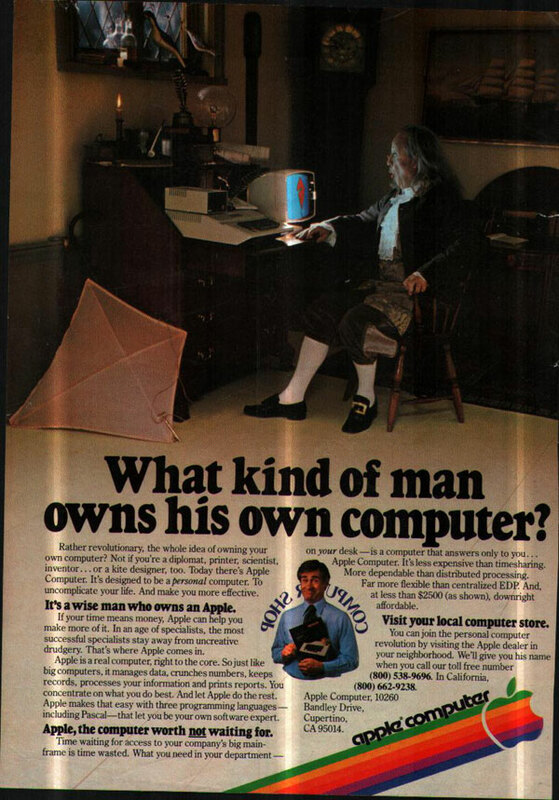 This ad (1980) did not promote a specific computer, but the very idea of buying one from Apple. The picture does not tell us what product is on the table, but it is from the Apple ][ family. Note that just a couple of years after this, a company called Franklin began marketing their own Apple ][ clones. This is the Apple IIc, which is seemingly being marketed in this ad as a portable. Apple introduced it in 1984. It could be connected to a TV or to a monitor such as the Apple 9" composite monitor. With its 1 MHz processor speed, it was considered as fast for such a small unit. With a 5.25" floppy drive and a maximum of 1 MB of RAM, this reminds us that computers have overcome amazing technology barriers since then! Do you have some old Apple ads? Scan them and send them to us so that other Mac and Apple fans can enjoy. A blast from the past. It is often refreshing to look back and compare today's technology to legacy computers of yesterday. It is especially interesting to remember what Apple used to be... more than 16 years ago. Don't laugh too hard though, because someone is going to pull up an add for a PowerMac G4 in 16 years and get a kick out of how quaint those "old dinosaurs" were with their "CD-RW" units.